Last week, DJI announced its latest quadcopter for industry: the Phantom 4 RTK. This product marks a major investment by DJI in the future of aerial mapping, and we couldn’t be more excited about the impact it will have on our community of drone operators. While DJI frequently releases new drone models each year, the Phantom 4 RTK isn’t your average drone. It’s a huge leap forward and will undoubtedly have a significant impact on aerial mapping for years to come. Why? The advent of a quadcopter with built-in RTK capabilities means highly accurate drone data is now accessible to anyone. And we’re happy to announce that Phantom 4 RTK data can be processed with DroneDeploy. Let’s break down why this is a big boon for the commercial drone industry and your company. Until now, gathering highly accurate RTK drone data required a large hardware investment on your part. You either had to shell out upwards of $25,000 for a fixed-wing drone with built-in RTK, add an additional PPK kit to an existing drone in your fleet, or create a custom RTK quadcopter. You can now buy a drone that comes ready to produce survey-grade maps off the shelf at a 3X discount to previous RTK systems. And it is compatible with the batteries and other accessories you already own with your Phantom 4 or Phantom 4 Pro. Use existing batteries and accessories you already own with the Phantom 4 or Phantom 4 Pro. The Phantom 4 RTK produces high-resolution drone maps (hello, 20MP sensor!) and 3D measurements that are accurate within a few centimeters — all without using ground control points (GCPs). We were able to test the Phantom 4 RTK in advance of its release, and our preliminary testing produced accurate measurements within 1–3 centimeters in X&Y, and 5 centimeters in Z. Not only will you gather more precise data, but your map exports from DroneDeploy will align perfectly to BIM models and other software. And when you compare maps over time, or side-by-side, each map will line up for more efficient comparisons. Why? Because each photo location taken with the Phantom 4 RTK is effectively an aerial GCP. That’s a huge win for pros comparing job site progress, crops, or even measuring aggregate stockpile volumes. Before the Phantom 4 RTK, if you wanted to use a complete RTK mapping system out of the box, it required a fixed-wing aircraft. While these are great for some industrial uses, they are difficult to maneuver and fly in urban and residential areas. If you want to inspect a building or take a quick survey of your site, you’d have been hard-pressed to do so safely with fixed-wing craft. With the Phantom 4 RTK you can take off, hover, and land on a busy construction site with ease, or inspect a roof in a residential neighborhood while avoiding trees and structures. The Phantom 4 RTK simplifies previous workflows with flight control built into the controller. The Phantom 4 RTK also simplifies previous workflows with flight control built right into the controller. And you no longer have to spend time setting GCPs every single flight. Though, we do recommend you continue to use some GCPs as checkpoints to ensure your data is accurate. While the Phantom 4 RTK doesn’t always eliminate the need for GCPs, it does reduce the number required — especially when flying smaller sites. On the processing side, photographs can be uploaded as normal to DroneDeploy. Images captured with the Phantom 4 RTK carry highly accurate location data and can be processed by DroneDeploy as is. This means faster workflows for your team without sacrificing precision. 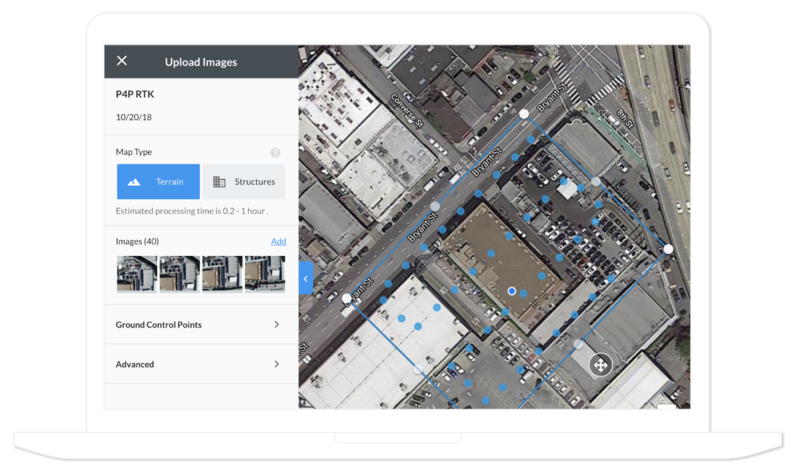 Each photo captured with the Phantom 4 RTK can be uploaded and processed with DroneDeploy’s Map Engine. We hope you’re excited for this announcement. And while DroneDeploy does not yet support automated flight for the Phantom 4 RTK, we’ll be working closely with DJI in the coming months to make this a reality. This drone will accelerate drone adoption in industries like construction, surveying, and mining and we’re excited to be along for the ride. The latest drone technology from DroneDeploy and DJI— like aerial mapping, thermal imaging, and digital terrain modeling — gives you a rich set of data to streamline your workflows and generate real-time, accurate insights. Accuracy is critical in drone mapping. Review linear measurement accuracy of DJI drone platforms and cloud-based photogrammetry in our free accuracy white paper. Read our free eBook on aerial inspection in the energy and construction industries. Watch our recent webinar with ENR, DJI, and McCarthy Building Companies to see how you can use drones on your next construction project.